I am a sucker for magazines with pictures of food. The checkout counter at the grocery store is always my downfall. You stand in line looking at beautifully shot photographs of what you wish someone would cook for you that night. I have finally quit buying so many, but have a sizable collection from over the years. What I never seem to get around to doing is trying the recipes out that look appealing and then tossing the magazine away. Case in point - my January 2004 issue of Sunset Magazine. I purchased this issue because it had a beautiful picture of enchiladas on the front cover (of course I have never tried it) and the title, "Easy enchiladas and other top-rated weeknight dinners." Six years ago I had three super busy teenagers and it was hard to come up with something that could be eaten on the fly. So into the grocery bag it went. I only ended up trying one recipe and it is one I keep coming back to once or twice a year. As with all the recipes that end up in my permanent collection, it has a unique blend of unusual flavours and a touch of what I would label fusion. In reading the article that accompanies this recipe, it turns out Singapore Turkey Stew was originally published in Sunset nine month earlier as Singapore Chicken Stew. When the magazine put out a call for Sunset Magazine recipes that have becomes weeknight favourites, this one came back with changes made to make it more economical and to use available fresh local produce. I have only made this second version and I love it, although my results have varied as I tried to substitute for missing ingredients or just plain made a mistake (like last night forgetting to stir in the cilantro right before serving). But when I nail it, it really is a great warm bowl of comfort on a cold night. Last night I created an Asian slaw to go with it and brushed slices of crusty bread with olive oil and broiled them. A perfect trio. Note - There are a couple of suggestions for Asian Coleslaw in the blog. One is included in the article Coleslaw Fast and Easy and the second is in the article on how to make Thai Chicken Tacos. 1 head bok choy (12 oz. ), rinsed, trimmed and cross-cut into 1/4" pieces. I like to use the mini bok choy when it's available. 1. In a large bowl, mix ground turkey, five spice, chili flakes, and salt. Shape mixture into 1-inch balls. Pour flour onto a large rimmed plate and roll balls in flour to coat lightly. 2. Pour oil into a 4- to 5-quart nonstick pan over medium-high heat. Add meatballs in a single layer. Cook, turning frequently, until lightly browned all over and barely pink in the center (cut to test), 5 to 7 minutes. Using a slotted spoon, transfer to a plate. 3. Add garlic and ginger to pan and stir just until fragrant, about 30 seconds. 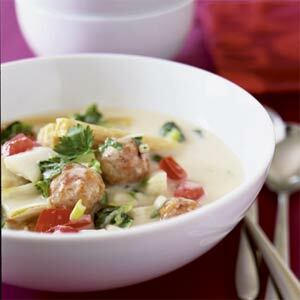 Add coconut milk, broth, and meatballs; bring to a simmer. Adjust heat to maintain a simmer, cover, and cook until meatballs are no longer pink in the center, about 5 minutes. 4. Stir in bok choy, baby corn, tomatoes, water chestnuts, green onions, and lime juice and cook, stirring often, until bok choy leaves are wilted and stems are barely tender to bite, about 5 minutes. Sprinkle with cilantro and serve from pan. - Ground turkey really varies as it can be made from either breast or thigh. Either will work, just personal taste. I did discover yesterday that this product is not as available as it used to be, so I tried making my own by mincing turkey breast in the food processor with a bit of sesame oil. Unfortunately this made the meatballs way too dry, so I don't recommend it. -Forming and browning the meatballs is the time consuming part of this recipe. When in a hurry I throw them on a greased or Pam'd cookie sheet and bake them until lightly brown. -I personally find ground chicken is a bit too soft for this , but you certainly could give it a try and let me know how you think it worked. -I also prefer the baby corn cut in 1/2 inch pieces. Just easier to eat. I did manage to find the original Sunset April 2003 recipe as well that uses 1 inch cubes of chicken breast instead of the meatballs and spinach instead of bok choy. I have not tried this recipe, but may give it a go next time. 1. 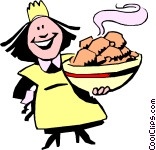 Rinse chicken, pat dry, and cut into 1-inch chunks. In a bowl, mix flour, salt, chili flakes, and five spice. Add chicken pieces and mix to coat. 2. Pour oil into a 4- to 5-quart pan over medium-high heat. Add chicken mixture, garlic, and ginger. Stir frequently until chicken is cooked on the outside but still pink in the center (cut to test), about 3 minutes. 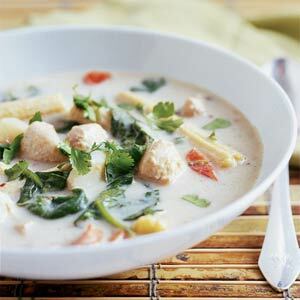 Add coconut milk and broth and bring to a simmer. Adjust heat to maintain a simmer, cover, and cook to blend flavors, about 5 minutes. 3. Stir in spinach, corn, tomatoes, water chestnuts, green onions, and lime juice and cook, stirring often, until spinach is wilted, about 3 minutes. Sprinkle with cilantro before serving from pan.